Posted under Health Guides. Updated 22 September 2015. Although meningococcal infections are rare, they are very serious diseases that can cause death. Luckily, there is a vaccine to protect you against many of the meningococcal infections. The meningococcal vaccine protects against the meningococcal bacteria which can cause serious infections such as meningitis (pronounced men-in-ji-tis), a brain fluid infection, and blood stream infections. The meningococcal vaccines help protect people against the most common types of meningococcal disease that are seen in the United States: Serogroups B, C and Y. Basically, there are 2 categories or types of meningococcal vaccine. One type protects against Serogroups A, C, W and Y meningitis and another category that protects against Serogroup B meningitis. 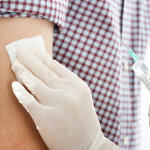 The Serogroup B (meningococcal) vaccine may be recommended by your health care provider in addition to the vaccine for A, C, W, and Y if there is an outbreak of meningitis, if you work in a lab that studies meningococcal bacteria or if you have certain medical conditions such as a problem with your spleen, or before you go to college. The vaccine is made up of parts of the meningococcal bacteria that cannot cause infection. When you get the vaccine, your body makes antibodies to fight the meningococcal bacteria. These antibodies then help protect your body from infection if you come in contact with someone who has meningococcal disease. When should I get the meningococcal vaccine? Most preteens (boys and girls) get a meningococcal vaccine when they are between 11-12 years old. A booster shot is recommended at age 16 or between 16-18. Other people who should get vaccinated are those who plan to travel to places where meningococcal disease is common (such as certain regions of Africa), people who may have come in contact with meningitis, anyone who has a disorder of their immune system, anyone whose spleen has been damaged or had surgery to remove it, and anyone who studies this disease in a lab. Do I still need to get a booster shot if I got vaccinated when I was a preteen? Yes! Since the meningitis vaccine is thought to be effective for only about five years, you’ll need a booster vaccine about 4- 5 years after you got your first (meningococcal) vaccine. If you were 11 or 12 years old when you were vaccinated (against meningococcal disease), you should have a booster vaccine when you are 16. If you missed your vaccine when you were a preteen, it’s not too late to get vaccinated. Talk with your health care provider. Teens who are at high risk for meningitis should receive a booster shot every 5 years. College freshman living in dormitories who received the MPSV4 (another type of meningococcal vaccine) 5 or more years ago should receive a dose of MCV4. If you have been in close contact with someone who has been diagnosed with meningococcal disease, it’s important to tell your health care provider. Ask if you had the vaccine and if you need to take antibiotics or another vaccine. This is true even if you have been vaccinated! It’s very uncommon to have side-effects from vaccines. Serious allergic reactions are rare (hives, swelling of the face/throat, dizziness, weakness, fast heartbeat) and start within a few minutes-1 hr. after the shot is given. If you think you might have had a side effect from a vaccine, talk to your health care provider. If you think you have had an allergic reaction, go to the nearest emergency room. Later, call 1-800-822-7967 or log on to vaers.hhs.gov to report the incident. Is there any reason why I should wait or not get the meningococcal vaccine? Most pre-teens and teens get the meningococcal vaccine without any problems. However, there are some reasons when you should wait or not get it. Is there anything else I should know before I get the meningitis vaccine? Yes. It’s a good idea to ask your health care provider about your vaccine history. Are there any reasons why I shouldn’t get the meningococcal vaccine? Do I have any known allergies to any medicine or vaccine? What should I do if I come in contact with someone who has meningococcal disease? Check with your health care provider about whether you are immunized and whether you need to take preventive antibiotics or vaccines for meningococcal Type B.
Meningococcal disease is a serious illness and the leading cause of bacterial meningitis in children 2-18 years old (in the United States). Bacterial meningitis infects the covering of the brain and the spinal cord. The meningococcal bacteria is usually spread by coming in contact with respiratory secretions when an infected person coughs or sneezes or by having contact with saliva (fluid in the mouth) when drinking from a water bottle, sharing cigarettes, and kissing. The bacteria may live in the throat without causing any symptoms, or may cause an infection of the blood or the fluid that surrounds the brain and spinal cord. The most common early symptoms are: high fever, chills, headache, tiredness, stiff neck and later, sensitivity to light, nausea, and vomiting. According to the Center for Disease Control (CDC), about 1200 people living in the United States will get meningococcal disease each year. Of these people infected with the bacteria, 10-15% will die, (even with treatment). The good news is most types of meningococcal disease can be prevented by getting vaccinated. Anybody at any age living anywhere can get meningococcal disease; the disease is most common in children younger than 5 years (infants are particularly at risk), teens 16-21 and people over 65 are at a higher risk. College students or anyone living in crowded living conditions are at a higher risk because the meningococcal bacteria are easily spread from one person to another. About 1000 people become infected with meningococcal disease in the U.S. each year. It is a very serious disease and even with treatment, about 1 in 10 people will die from it. For those who survive, about 20% may have permanent damage such as deafness, seizures, mental retardation, or loss of fingers and toes. Meningococcal disease is treated with antibiotics such as penicillin. Early treatment is very important! The best form of protection against this serious disease is PREVENTION – getting vaccinated! Quiz: How much do I know about vaccines?